This is the first of two posts. Want to hear more about Historic Charleston's new app? Attend our January webinar to hear Lauren Northup and two other panelists talk about technology and storytelling. Sign up for the mailing list today. In October, Historic Charleston Foundation took an exciting leap—we partnered with a consulting firm to develop our own app. The app will serve as a guide to our two museum houses as well as tell the larger preservation story of Charleston, South Carolina. The first of its kind in the city, our app will interweave audio (such as in-depth interviews with community experts and oral histories), text, and historic pictures to tell a more complete story of this complicated, beloved, and incredibly well-preserved American city. Charleston is a city of dramatic contrasts, nowhere more so than in its presentation of its history to the public. If what you seek is a romantic, moss-draped view of antebellum Charleston—a fictional place largely dreamed up during the Jim Crow era to attract tourists to a depressed city ravaged by the Civil War and Reconstruction—you can certainly find it. It is the stories of Charleston’s more recent history, as well as its African American history, women’s history, immigrant history, LGBTQ history, and working-class history that remain largely untold. Such gaps not only speak volumes about the priorities of Charleston but also ignore the reality and challenges of the city’s history. As a citywide preservation organization, we realized that we had a unique opportunity to interpret these overlooked and forgotten narratives through the Historic Charleston Foundation app, and thus to help shape the narrative of our city moving forward. First, I have to admit something. Our visitation numbers are declining. It isn’t a precipitous decline, but if you compare the number of people visiting Charleston every year—growing by leaps and bounds each time Condé Nast votes us the “Number one city in the United States”—to the number of people visiting our oldest museum house, the Nathaniel Russell House, the rate is nearly perfectly inverted. So how can we reverse this trend? What will bring these visitors in? And why is visitation growing at our other museum house, the Aiken-Rhett House? These are the questions that keep me awake at night, and they were also a driving force behind developing this app. Historic preservation is not doomed to irrelevance, but historic preservation in its traditional model is. The familiar house museum approach of herding visitors behind velvet ropes and showing a distinct wariness to confront difficult history cannot remain our strategy for educating and, perhaps more importantly, attracting paying visitors. We must change almost everything—at least, that was where we started. Easy, right? As we began to ponder our options, we took stock of what was working. We have watched our Instagram account (follow us @historiccharlestonfoundation) grow from a measly handful of followers when we began in 2013 to nearly 50,000 today. With a single post we can reach the same number of people we reach over the course of an entire year of public tours at the Nathaniel Russell House. The reach of Instagram—and its ability to facilitate discussion and raise community awareness of preservation issues—is a miraculous thing. 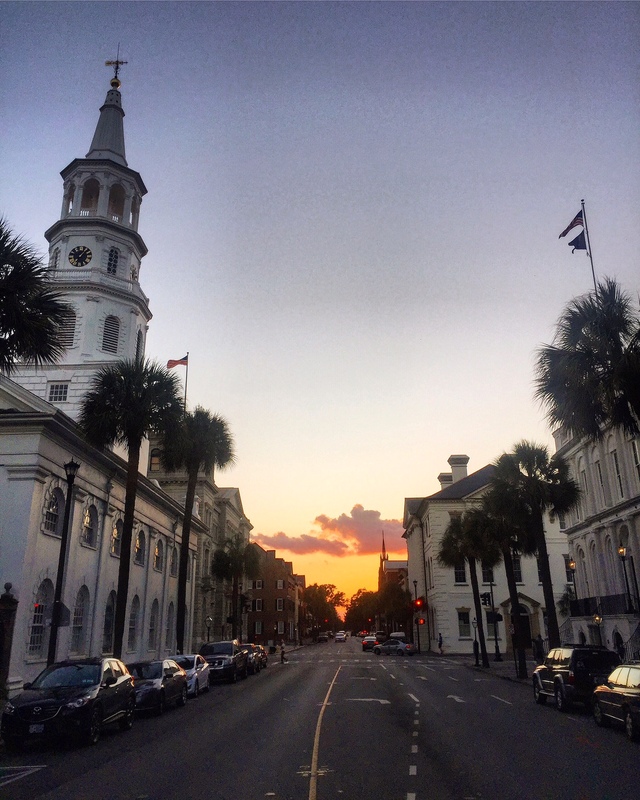 Our Instagram is a love letter to Charleston. Our goal is to make people laugh; to make them ache for the loveliness of the historic district; or perhaps to gently point them toward an overlooked portion of our city’s complex and, at times, incredibly painful history. Our tone is reverent irreverence–there are no velvet ropes. And what we are doing is working, and it is working particularly well with the demographic we must cultivate in order to survive: millennials. Museum industry chatter tends to pin all the blame for declining visitation on the vacuous, self-absorbed millennial, but the reality is more complicated than that. Through giving tours to younger people, even those who are not connected to history-related fields, I have learned that they hunger to go beyond the ropes and develop a deeper understanding of the horrors; triumphs; and, ultimately, the lessons to be gleaned from our collective past. Although visitor numbers to historic sites in Charleston are in decline overall, it seems that traditional historic house sites are struggling the most. Museums that confound visitor expectations of an old-fashioned tour—such as McLeod Plantation Historic Site, the Old Slave Mart Museum, and the Aiken-Rhett House—continue to show robust and, dare I say it, growing visitor numbers. These sites focus on the more difficult aspects of Charleston’s past: slavery, the Jim Crow period, and the Civil Rights era. This suggests that, far from seeking to avoid engagement with the past, many of those who no longer visit traditional historic sites are instead eagerly flocking to places that offer a tangible connection to a past—not one of sumptuous drawing rooms dense with fine and decorative art, but instead one that reveals and honors the experiences of ordinary people. Another idea also drove the development of our new app. One of the most interesting, dramatic, and often overlooked stories of Charleston is the story of its preservation. Many visitors think the city is preserved merely by accident or by virtue of the fact that Charlestonians were “too proud to whitewash, too poor to paint.” The reality is that generations of forward-thinking citizens devoted their lives to the preservation of Charleston through active planning, advocacy, and legislation. The history of 20th-century Charleston is the story of Historic Charleston Foundation: the story of easements, covenants, and boards of architectural review, but also of corpses, high explosives, and billion-dollar catastrophes. The silence about all of this is less troubling than the silence about the city’s social and racial history, but these are nonetheless stories that need to be told—Charleston may be a beautiful city, but why? Lauren Northup is the director of museums at Historic Charleston Foundation.